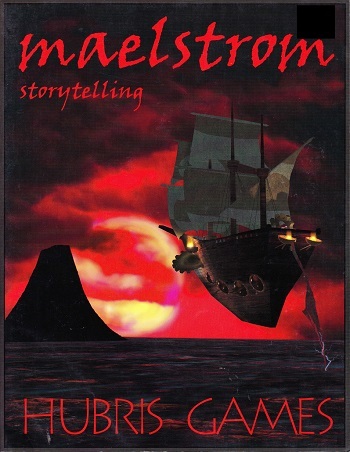 Back before there were indie games, or story games, or even before games like Sorcerer and Dogs in the Vinyard, there was Maelstrom Storytelling from Hubris Games (currently owned by Precis Intermedia). Coming out in 1997, one of the early games in the genre of narrative games, Maelstrom is really only predated by the first edition of Atlas Games' Over The Edge in this genre. Mentioning Over The Edge is important, because both games are similar in that they use descriptors to describe your characters, however the main difference is that Maelstrom departed from the "mainstream" of game design at the time by moving to a scene-based method of resolution, rather than the task-based method that is tried and true amongst most role-playing games. For those who are not certain what the difference between these two types of resolution, let me give a quick explanation of each. Task-based resolution, which is used in many games out on the market, breaks down how your character does things into a series of distinct tasks. Open the door. Pick the lock. Disarm the trap. Each of these tasks are done in consecutive order by the characters. Scene-based resolution looks at things differently by taking the end goal into mind, rather than a series of tasks. For example, in a scene-based game if we look at the above list of tasks we could create a scene that works like "Seeking to get the contents of the safe out of the room, the burglar quietly enters the room by picking the lock on the door, working the tumblers on the safe's combination lock to crack it, and after putting the contents of the safe into his bag, quickly and quietly sneaks back out of the room." Basically, in a scene-based system you work out one roll for the entire "scene" that you wish your characters to do, and then the success of the roll lets you and the game master work out what actually happens. Typically the end result of the two systems is the same (in both examples complete success means that the character successfully breaks and enters and escapes with their ill-gotten gains), the main difference is in the amount of dice rolling involved. By breaking things down into the success or failure of an entire scene you can avoid some of the pitfalls of task-based resolution, like failing at the middle task in the list of things that you need to get done for your character to succeed. This can end up sidetracking things when your thief is able to get into a room but cannot open the safe in the room. Some games also refer to scene-based resolution as conflict-based resolution. Maelstrom Storytelling took this a step further by giving scenes "aspects" (yes, that was the term that they used, way back when) that broke down what type of scene the characters were involved with. These aspects also influenced character traits, giving them advantages or disadvantages in specific scenes. These aspects were Mind (for scenes about perception, social interaction, or anything mundane that does not fall under a physical category), Matter (all about the physical), Spirit (for scenes about the power of belief and the "hidden inner strength of the soul"), and Chaos (for scenes about understanding or dealing with the Maelstrom itself). These aspects also line up with character traits (called Affinities). Affinities help define the culture, skills and talents of a character, and depending on their aspect, they can help or hinder your resolution of a scene. Characters also contain descriptors that describe things like your character's personality, psychological makeup and physicality. These descriptors can be used as bonuses in scenes, to help your character succeed. The game's creator, Christian Aldridge, was still feeling his way through what he wanted to do with the Story Engine (the underlying rules that powered Maelstrom), so the implementation of them in this book are not as good as they could have been. A lot of the explanations of how to do things are still sketchy, and will require some lifting from the game master. Some of this was dealt with in the revised and generic version of these rules (just called Story Engine), while others would still plague even that version of the rules. 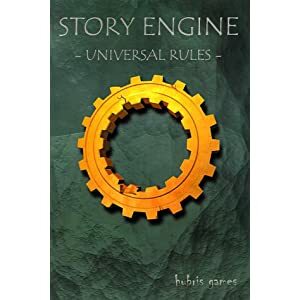 Aldridge was really on to something with his Story Engine rules, but unfortunately the language to describe what he wanted to do did not yet entirely exist. I think that understanding a lo of what Aldridge was wanting to do might be easier to understand for contemporary gamers who are better versed in this style of gaming. Precis Intermedia has a third edition of this system that is currently available in print and in PDF. Maelstrom/Story Engine used an interesting take on the dice pool that is a bit reminiscent of earlier games like Greg Stafford's licensed Prince Valiant game. The game used a success counting system that considered getting an odd number a success. This meant that, really, you could use any dice for a Story Engine game, because the chances of getting an odd number is the same on all dice. You can also "burn" a Descriptor that has an aspect the same to a scene in order to expand your dice pool. The setting itself for Maelstrom is also interesting. It is one of those inter/cross/multi-dimensional settings that were very popular in the 90s. The Maelstrom (in the games) is a roiling multi-dimensional nexus into which the characters end up. There are realms and cities within The Maelstrom like The Fold, which is described as "The Fold is a land bridge between Nether and Farlong. Near sea level, the Fold is lightly forested and mild in climate." There is more, but that gives you an idea. The multi-dimensional nature of the setting is enforced mechanically by the Affinities of the characters. Affinities tell you who a character is and where, across the Maelstrom and beyond, they are from. They help to make a character a part of the world, and make the world a part of the character. Why should you be interested in this, you might be asking at this point. Well, from one viewpoint you can look at Maelstrom as being a cusp before the contemporary mode of story games broke in a wave onto gaming. From a historical viewpoint, you can see how what had come before in gaming informed the design of this game while it looked forward to a style of gaming that it hoped was coming. You could also look at this as a fun game that has an engaging setting that would appeal to those who want a lighter approach to mechanics and character generation, one that mechanically backs up a more narrative approach to gaming. This is a complete and playable game that should have more recognition than it gets, and part of the point of this piece is to spread the word about it. The Story Engine is also ideal for online play, whether in play by post or in virtual table tops like Skype or Google+ Hangouts, because of the pacing of scene-based resolution. I think that scene-based resolution lends itself to a play by post format, because of the delays inherent in that mode of gaming. Precis Intermedia is the current owner of Maelstrom and the Story Engine. You can get facsimile PDF editions of either Hubris Games edition at RPGNow/DriveThruRPG (the links with affiliate codes are in the previous sentence). You can also get more information about the current version of the Story Engine and other fine Precis Intermedia games from their website.